ARE YOU ALWAYS LATE FOR APPOINTMENTS & MEETINGS? 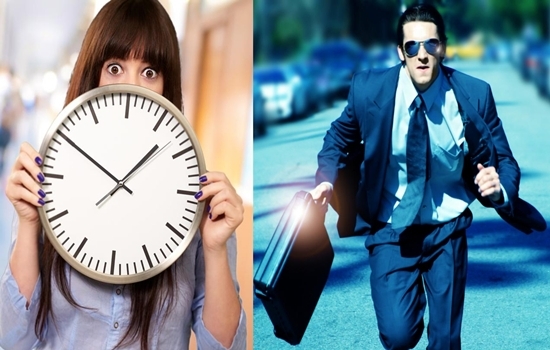 Do you always run late to meetings and appointments? First, write a list of the different items you need to pack; this will save you time. For example, if you are meeting your trainer at the gym, you may list your workout clothes, towel, sneakers, gym membership card and water bottle. For easy reference, put this list into your calendar. When it comes to leaving on time, your mind gets occupied, so pack your things a couple of hours in advance when your mind is still calm and cool, instead of waiting till the last minute. Do not get involved in many tasks before leaving for appointments; just focus your efforts on getting ready to leave. Quit the habit of doing “just one more thing” as you get ready to leave; back away from the pile of laundry that needs to be folded or the stack of papers that needs to be filled. Doing this, just like multi-tasking, takes over your initial goal of leaving on time, and it is disruptive to your schedule. The next time you find yourself reaching to finish an extra task, stop and fix your mind on getting ready for your meeting. Scheduling back- to- back appointments is a major reason for lateness; if any of your appointments is delayed, you will be late and have to make up for lost time. It is important to schedule your travel time in your calendar to make it clear as to when you need to pack up and hit the road. Going from one appointment to another can be fraught with travel delays and other headaches, so add a time buffer to your travel time; this buffer of time will cover any unseen delays. Be careful about how you plan your travel; download a transit app on your phone, check schedules online or pick up a schedule booklet.